Mosaic image of mouse cerebellum reconstructed through automated acquisition and stitching of over 1700 individual tiles in the X, Y and Z planes, triple labeled for astrocytes (GFAP; Red), gap junctions (Connexin 43; Green) and nuclei (DAPI; Blue), and imaged using multiphoton microscopy. The contrast and brightness were adjusted on the thumbnail image for display purposes. This image has been downsampled from the raw data image which can be accessed using the link provided to the Cell Centered Database. 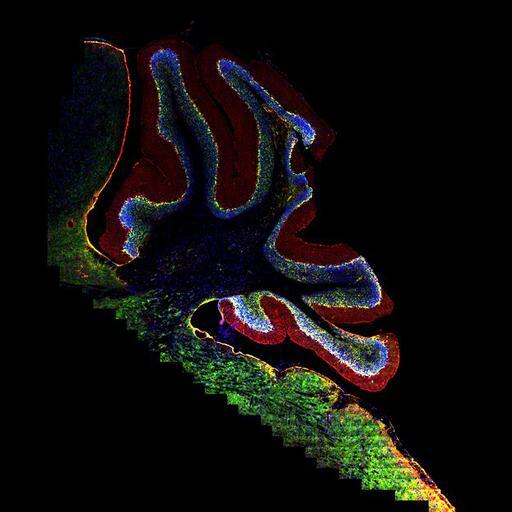 Mouse brain was perfused with 4% paraformaldehyde, sectioned through the cerebellum in the sagittal plane on a vibratome (50 µm). Tissue sections were immunostained using Rabbit Cx43 antibody (Sigma) 1:600, and Chicken GFAP antibody (Neuromics) 1:500, 72hour incubation at 4C. Secondary antibodies were Donkey anti rabbit-Al488, and Donkey anti-chicken-RRX, 2.5hour incubation at room temperature, followed by staining with DAPI. Sections were mounted in gelvatol. Individual images were gathered using a Nikon PlanApo 60X NA 1.45 objective on a BioRad RTS2000 multiphoton microscope. The mosaic image was generated by tiling 37 (X) x 48 (Y) maximum projection images.